Enter what you would like on the shadow box. 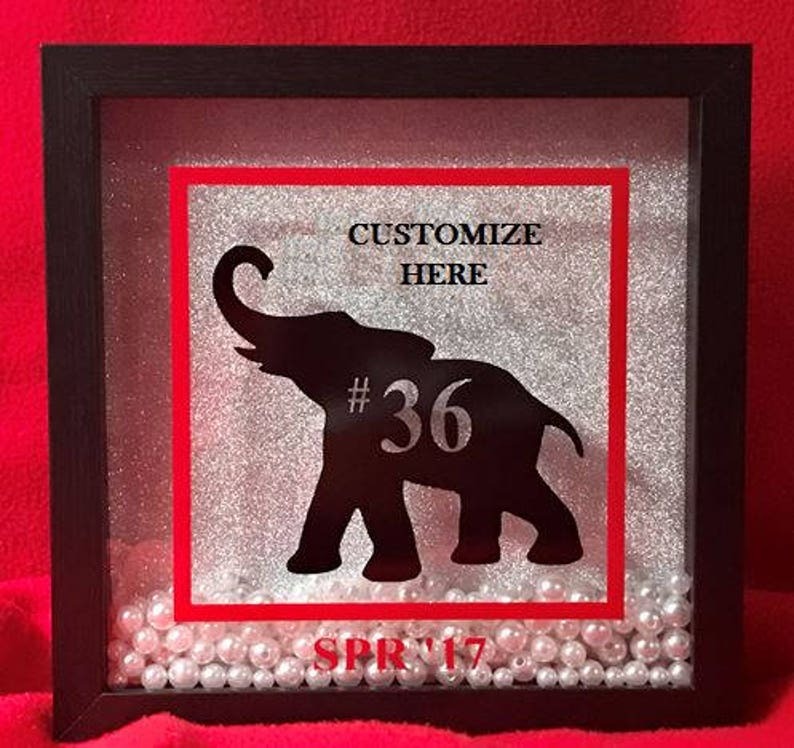 This Elephant Shadow Box will definitely make a statement!!!! This beauty will be a unique addition to your decor, great for your home or office. Perfect for you or as a gift. This shadow box comes in black; with or without pearl accents against a glittery silver background. The frame measures 10" x 10" and is approximately 2" in depth. It can stand on its own (as shown in the photo), used with a display stand, or can be hung on a wall. Customization is available. AT CHECKOUT, LEAVE CUSTOMIZATION REQUEST IN THE NOTES TO SELLER SECTION. Ask me about other designs. Orders are ready to ship in 1 to 3 business days, depending on when the order is placed. If you need your order by a certain date, please provide this information. While I will do my best to accommodate your shipping request, I cannot guarantee delivery dates. According to USPS, Priority Mail is 1, 2, or 3 business days based on where your package starts and where it’s being sent. Priority Mail Express is the fastest mail service offered by the Postal Service. It provides guaranteed 1-Day or 2-Day expedited service by 3 p.m. When placing your order, please take in consideration both production and shipping time. 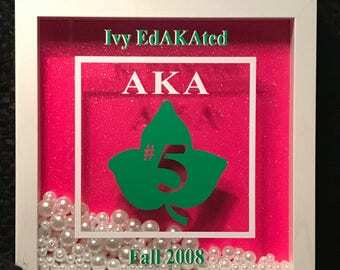 I absolutely Love this...hope my new Soror to be will too. Thx U! This is absolutely adorable. I was very happy with the finished product and the timeliness of the delivery.